Don’t go back to sleep!You must ask for what you really want. I used to think that I needed to work really hard to strive to get what I wanted in life, but as I’ve gotten older, I’ve found that listening deeply gets me closer to my real goals. Sure there’s hard work involved in reaching any goal, but first we need to make sure that we’re headed in the direction that’s right for us. And that we’re centered within ourselves. Only then can we ask for what we really want and begin to find it. one of the best gifts we can give ourselves is the gift of the right questions and the gift of time to be with those questions, listening, asking, learning, testing out which responses are right for you. I’ve created these simple but profound questions to help you slow down, get back on center, and focus on what’s important to you. Before you answer these questions, I invite you to take two minutes and breathe deeply. Close your eyes and put your hand on your heart and feel your chest expand and contract as the air comes in and out of your body. Then write your answers down. If you don’t have time to do this now, just read through the questions now and let the questions percolate in you. Then you can come back and write your answers down later. Rumi is right: you must ask for what you really want. To do that, it helps to put what you want into language; language helps us know and shape our story. 4) What activities give you a sense of meaning and of connection with the people, qualities and activities that you value? 5) What activities help you make sense of the meanings and values of your life? 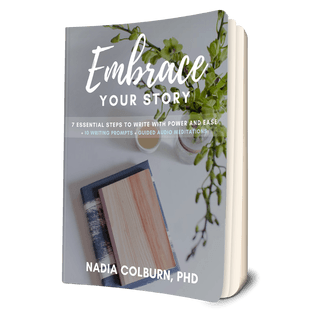 6) Do you–and does your story —feel heard and seen? 7) What would it feel like for you to be heard and seen and expressed fully, in all your desires? 8) What is one shift that you can make in your life to give more time and energy to something that you value and desire? When you answer these questions, write down whatever comes to your mind. Then you can go through the answers later and see which ones you want to keep. Also you might write down desires that are unachievable. That’s okay. The next step is to ask yourself: what can you do in your own particular life to come closer to that outcome. Often, when I answer questions like these my first answers are impossible: for example, I might say, what I really most desire is world peace. That is true. But it’s also not something that is in any way in my control. So the next step then is to say: okay, what I want is peace, so what can I do to help create peace? For many years I did volunteer work as at a pacifist organization. Equally, if not more important, I also learned how to meditate and cultivate inner peace in myself. I have personally found that the things I most desire and value are not about outcome as much as they are about process itself. If you enjoyed this post, please share it with friends.